Surely we aren’t the only ones excited for the Horsham Fake Festival that’s taking place at our very own Club on Saturday 4th June?! With just a few weeks to go until some of the UK’s biggest tribute acts hit our stage, the countdown is well and truly on. Not only are we welcoming leading acts such as The Jam’d and Four Fighters for this family-friendly festival but it’s an opportunity for some of Horsham’s best loved local bands to strut their stuff and get their fantastic music heard. Tell us more about The Supernotes and how you got started in the music industry. The band consists of Tobi, Ali, Liam, Dean and myself. Liam, Ali and I have been playing music together since we were young guys involved in our local church. We then went on to do various projects: Ali and myself went to study at The Academy of Contemporary Music in Guildford which is where Ali met Dean. 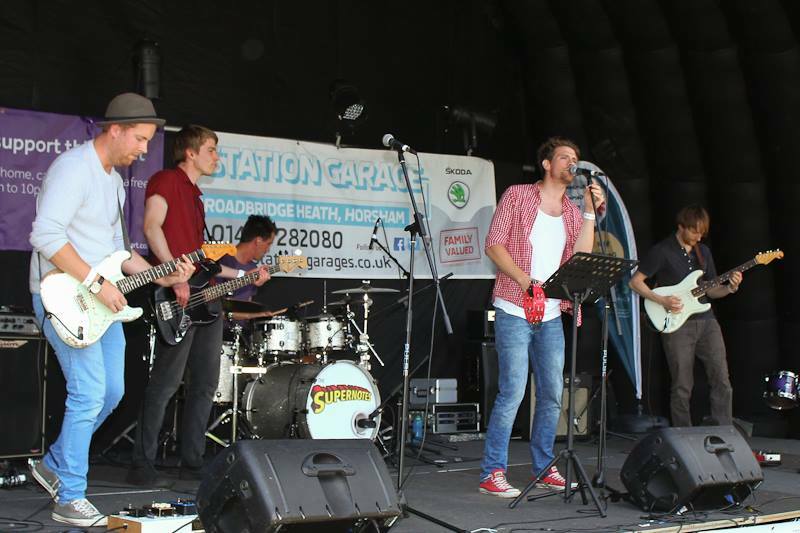 We were also involved with Horsham’s famous Battle of the Bands competition and the Horsham community gospel choir. A couple of years ago lost our singer in a local function band we plated in so Ali’s brother in law Tobi stepped in the frame. And now here we are! We all love performing live; we get great pleasure out of seeing people having a good time and enjoying what we do. We love that music can connect with anyone regardless of nationality, race etc and we love playing songs that people enjoy, dance and sing to. We also like to put our own flavour on songs so it makes us stand out. We can’t wait to play at Fake Festival! The line up is brilliant and you can’t beat a good festival. People will be having a great day out and it’s always good to play to some new faces…and you never know, the sun may even be shining! We have different musical preferences so our favourite festival line up could be pretty diverse. Possibly something like Blink 182, Stevie Wonder, Muse, Queen and Bruno Mars! Favourite album of all time?! That’s almost impossible to say but I guess for me and Tobi, I know we love the self titled Blink 182 album. Travis Barkers drumming is just awesome on that record.